In December 2000 a group of enthusiasts formed the Orkney Yole association with the aim of preserving the craft and promoting its use. The association has over sixty members comprising a small nucleus of owners and active sailors and supporters who want to preserve this once vital part of the economic and social life of the islands. Until the mid 1960s the yole was the Islanders' motor car and pick-up truck, transporting coal, peats, animals, animal feed, fish, cheese and eggs to the market, the weekly groceries and, of course, passengers. By the 1930s most working boats had converted to motor. The racing men had mostly exchanged their spritsails for gunter rig, and a new version of the yole appeared in the shape of a very elegant spoon-sterned vessel Skua, built by Willie Ritch of Deerness for the writer, Eric Linklater. Eric paid the princely sum of £45.18.5½d. for her, including mast, spars and oars. Of this, Willie received £18 for his time, the remainder being the cost of materials. At the end of the Second World War the sailing yole had virtually disappeared. Even the Skua became a fishing boat with a petrol, and later a diesel, engine. The exception was at Longhope where a small nucleus of sailboats remained, the gunter rigged yoles Pansy, Irene, Tiger, Emma and three spritsail yoles, Daisy, Family Pride and Elsie. Willie Tulloch of Stromness bought Emma in the late 1960s and Juni Merriman acquired the Elsie. The Daisy stayed in Longhope and is now part of a static display at Lyness. The remainder were brought on loan to Stromness Academy's Navigation Department where, for several years, the boys and girls of the town learned to sail in them. 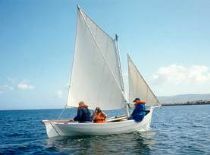 About this time the spritsail disappeared from the scene completely, until a cousin, Dennis Davidson, re-fitted a small Flotta yole and launched her in 1995 with a single spritsail and jib. By 1995 Willie Tulloch’s gunter-rigged Helga was probably the last sailing yole in regular active service. 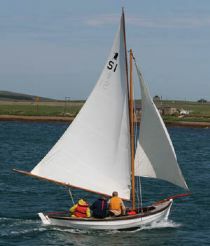 Then Dennis Davidson did the first restoration on a small South Isles yole which he fitted with a single spritsail and jib. In 1999 Len Wilson and Maurice Davidson launched their new home-built Gremsa. She is an 18 foot South Isles yole carrying two spritsails and a jib. The yoles sail regularly on weekday evenings throughout the summer and visitors are always welcome.